Rotary District project to provide Kisii District Hospital with a continuous supply of clean running water. The project progressed slowly because of delays in receiving funding. While waiting the arrival of funds, the community dug a trench from the spring location about a kilometer uphill to the hospital water storage towers. Once funds arrived work progressed smoothly starting with the location of the eye of the spring and building of the filtration system. During the course of digging a second spring was located and this two was tapped to provide water to the local community and as a back up to the primary spring. The second spring, however, is seasonal. While work on the spring was progressing, a pump house was built, the pump was purchased and installed, and savings in construction costs allowed the purchase of what was to be a back-up diesel generator. The back-up is now serving as primary while the hospital waits for the government to install three phase power to the pump. The cement facility built where the community has access to spring water exceeded all expectations. the water flows throughout the day on a schedule that allows women to draw water in the early morning and vendors to draw water later in the day. There are platforms built to facilitate washing clothes and businesses are sprouting up around the facility. At night, the water is redirected to filling up the hospitals water storage tanks. 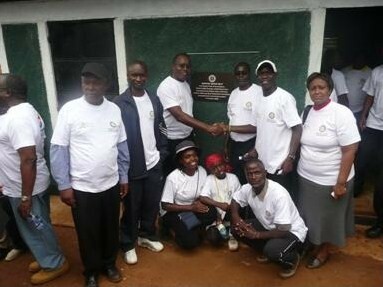 I attended the official handing over to the community of Mosasa water project from Rotary International at Kisii Hospital on 15 November 2008. The day began by a 5K walk around Kisii town to involve the greater community and to celebrate this mystery of life – water! This was followed by the official opening of the project by the Deputy Mayor of Kisii, Mr. Kennedy, then refreshments, entertainment, speeches and lunch. It was indeed colorful as dancing and singing rocked the grounds of Kisii town and its neighborhoods. The entire hospital staff was welcoming and we had guests who came from within and outside Nyanza province and all the way from the USA who witnessed this colorful day in Kisii town. We were pleased that several members of the Rotary club of Hurlingham could join us: Ken Idwasi with his two sons, Remmy Koech and his wife and Ms. Ndila a friend of the club. 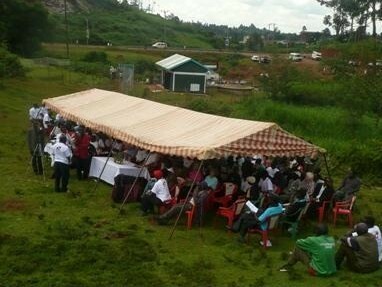 Everyone was pleased for this day, to celebrate this amazing achievement at Kisii Hospital. It was very great to see the water project, the pump and the store house and how much people are benefiting in the hospital. Great thanks goes to all who participated in funding this project lead by Rotary club of Hurlingham, Rotarian Don Howard and his team from Colorado USA, Blue Planet Run Foundation and many others who donated in aid of this successful project. The Kisii fraternity asked me to send a lot of wishes and THANK YOU to the BPRF for your support. I visited Blue Planet Run's project in Kisii, a crowded town nestled on top of a hilly, green part of the countryside. I met with the Hospital Superintendent Dr. Otomu, the District Water Engineer Mr. Orangi, the Head Nurse Mrs. Monayo, the latter two walked me through the project; I later met with Dr. Mogoa, former Kisi Hospital Superintendent. 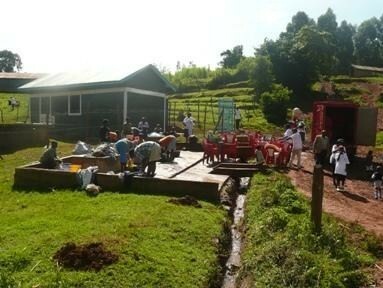 Eight months ago, the Kisii District Hospital Water Project became functional – running water in the hospital! The project has been an incredible success, both for the hospital and the community. Part of the project was to construct water points at the Mosasa stream source for the community and a washing bay for women who come to wash their clothes. Because water is stored and directed to the hospital only overnight, the community still uses the source throughout the day; there's even an emerging market near the washing bay now. The water pump has functioned with no problems and is easily delivering the 100,000 litres of water the hospital needs daily. Visiting the water source, one can easily see why this is where people were collecting water for the hospital and why there are always so many people taking advantage of the water available: despite the capture of 100,000 litres overnight plus the all-day use of the community, there are still multiple streams all around – you even have to cross through a deep puddle to get to the water pump and storage tank! Since the water project was completed eight months ago, the Kisii Hospital has been elevated to a Provincial Hospital. That means it is the referral hospital for the entire Kisii District, whereas before special operations would have been referred to a larger hospital. This is a huge improvement for many patients in the area, who already struggle to get to Kisii from their villages as they won't have to travel any further. The major roadblocks the project faces at this point are electrification and a piping network. The water pump is currently working on a generator and long-term maintenance will be more effective if it is operating through electricity. Also, water is not supplied to every ward in the hospital, but to the most central wards. In an ideal world, it would be available in every room. Everyone at the Kisii District Hospital was very grateful for water: telling me how the hospital is better, how people aren't dying like they were before, how happy they are, how it's allowed the hospital to save up for renovations. When people from the community see the former Hospital Superintendent who oversaw the project, they say "you did it!" Maintenance funds are derived from the savings generated by not purchasing the municipal water system and water vendors. The District Water Engineer, who supervised the project also assisted in training hospital maintenance personnel and do scheduled maintenance inspections. Completion of the project was delayed awaiting the local power company to extend three phase power to the pumping station and construction of a security fence. The back up diesel generator provided the power to pump water to the hospital. The project was completed in the fall and the dedication ceremony took place in November. The hospital expects power to be hooked up after priority projects for providing power to schools are completed. 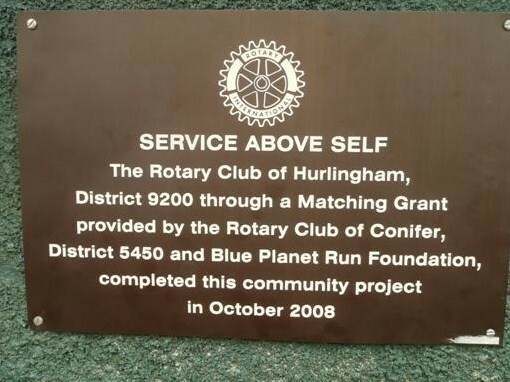 Blue Planet Run was prominently displayed as a partner with Rotary on a large plaque at the entrance of the hospital and a second plaque at the community access area by the pumping station.. There was widespread publicity throughout the area and in Kenya's national news and television about the project and the role Blue Planet Run has played. The participation of a Kenyan in the Blue Planet Run will also be featured. 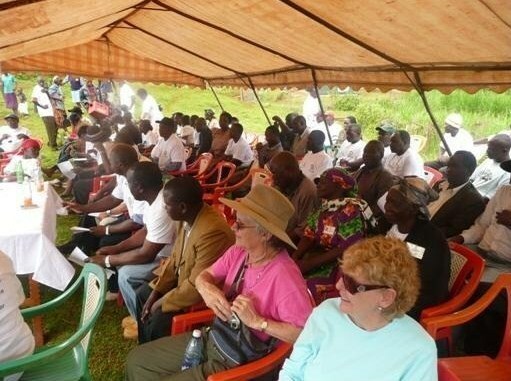 The project was led by the Rotary Clubs of Conifer, Colorado and Hurlingham-Nairobi . Rotarians Carol Carper, Don Howard and his wife, Pat, visited the project in June,2007 and documented existing conditions through video, pictures and interviews. A follow up visit was conducted in June, 2008 and June 2009 to evaluate the project. The Hurrlingham Rotary Club disbursed funds, monitored results, maintained records and solved problems. Don Howard, his wife, Pat, Dr. Mogoa, Hospital Superintendent, political and civic dignitaries and a crowd of 300 gathered for the ground breaking ceremony. The schedule established for beginning the project was delayed because of the great number of water and other humanitarian projects processed by Rotary International Foundation at this time of year. It was further complicated by some missing details in the instructions for transferring funds. Once the funds were received, the community layed the pipes, materials were ordered and delivered expeditiously, and progress was satisfactory except for the delay in the delivery of three-phase power. All parties worked together harmoniously and care was taken to install quality materials with an eye toward sustainability. 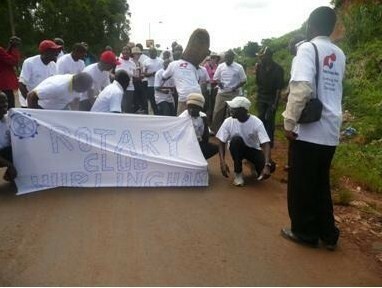 The Host country sponsor, the Hurlingham Rotary Club, is located in Nairobi, a six hour journey to Kisii. Coordination and supervision was difficult because of the distance involved. Attempts are being made to establish a Rotary Club in Kisii so that sustainability can easily be monitored. The Japanese government had been waiting for several years to construct a million dollar addition to the hospital. However, a reliable source of water was needed to operate the heavy equipment needed for construction. Our water project provided the answer and construction is underway at the hospital. This number reflects the hospital staff and nursing school. The patient figures vary but will average about 600-800 daily. In addition, community members have access to a protected spring facility with excellent water quality. That portion of the project is completed and being extensively used throughout the day. Water is pumped to the hospital during the night. It is being routed to the laundry, kitchen, operating area, the "amenities ward" and will be available to the new 150 bed addition when it opens in the fall. Hospital staff and patients must use outdoor pit latrines because of lack of water to operate newly renovated indoor facilities. However, problems were encountered with leaks in the plumbing within many of the wards. Interior plumbing is the responsibility of the Health Ministry and was not part of the project. The plumbing is being replaced gradually using savings generated by not purchasing water from the city and water vendors. Until the plumbing is completely renovated, the hospital will not reap the full benefits of the project. In addition to providing water to the hospital, the project has provided taps for the community to use and a place for washing clothes. Many women are using the protected spring area for washing clothes rather than the nearby and heavily polluted river. The protected spring is now a social meeting place. Small business stands selling fruit, vegetables and other products have sprung up and we observed one enterprising woman opening a hair washing and styling business at the spring site.